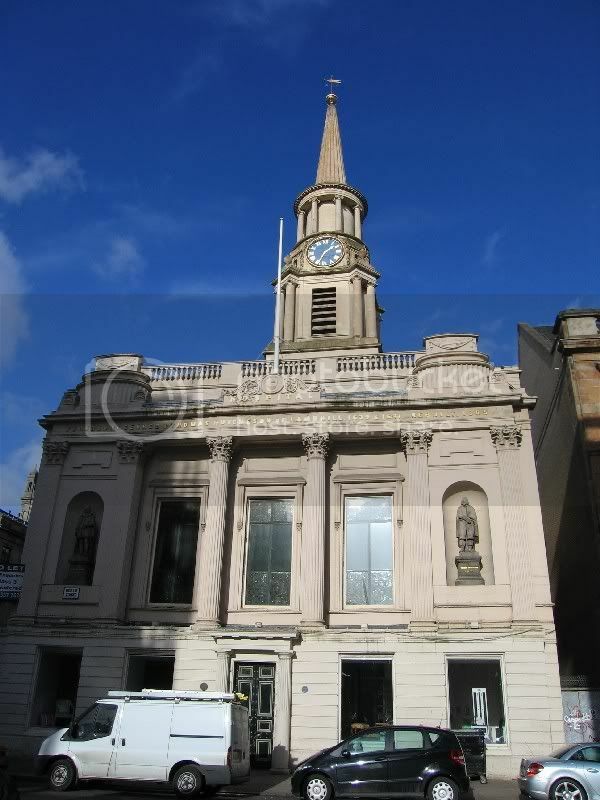 Thought I would dip my toes in the water here with a couple of pictures of another Glasgow steeple - This time Hutchison Hall in Ingram Street , built in 1805. Lovely (and thanks to HollowHorn for rightly pointing out this needed a new thread). So how does one get up this steeple? I did read that the statues were placed on the wrong plinths when the statues were removed for building renovation. I have always loved this building. Here are a couple of photographs I took around 1991. Thanks HH for creating a thread for this subject. I'm off out for the evening ,but I will post more pics and details tomorrow. Extract from the Merchant City Heritage Trail leaflet. 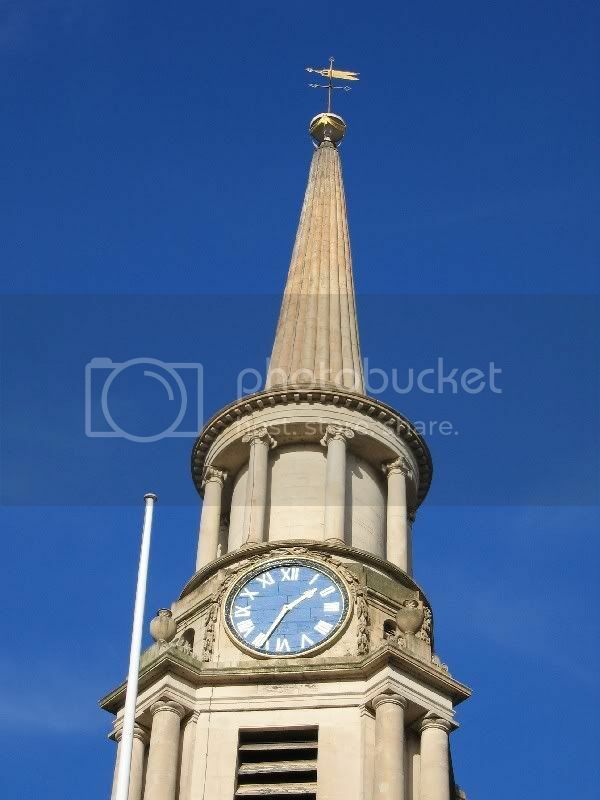 The front of the building on Trongate was adorned with a 100 feet high steeple complete with a clock and bell. To the north of the main complex was an extensive garden open to the public as well as to the inmates. 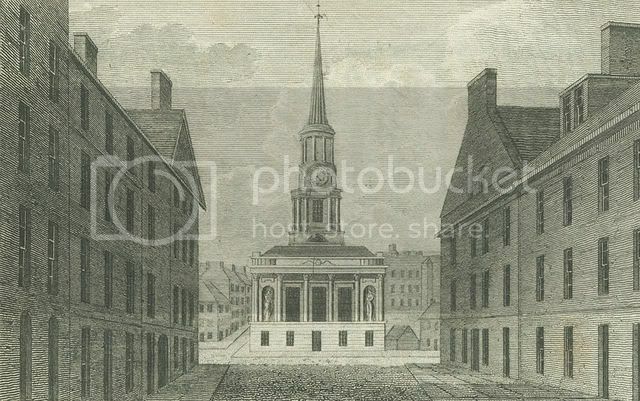 Statues of the Hutcheson brothers were placed on either side of the entrance at the foot of the steeple. The hospital was maintained by revenue from the rentals of lands in the Gorbals, Ramshorn and Meadowflat, but funds became scarce soon after the building was completed. Parts of the hospital were acquired by businessmen and shopkeepers and the close was used for bull-baiting. 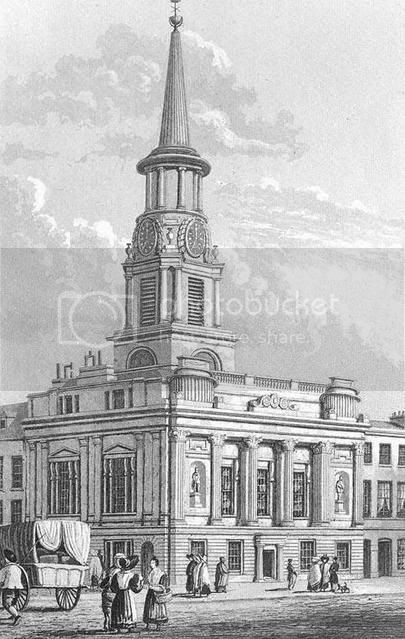 In 1795 the site was sold to make way for the creation of Hutcheson Street, and the Patrons invested the money raised from the sale in the erection of a new Hospital in Ingram Street - now known as Hutcheson's Hall. 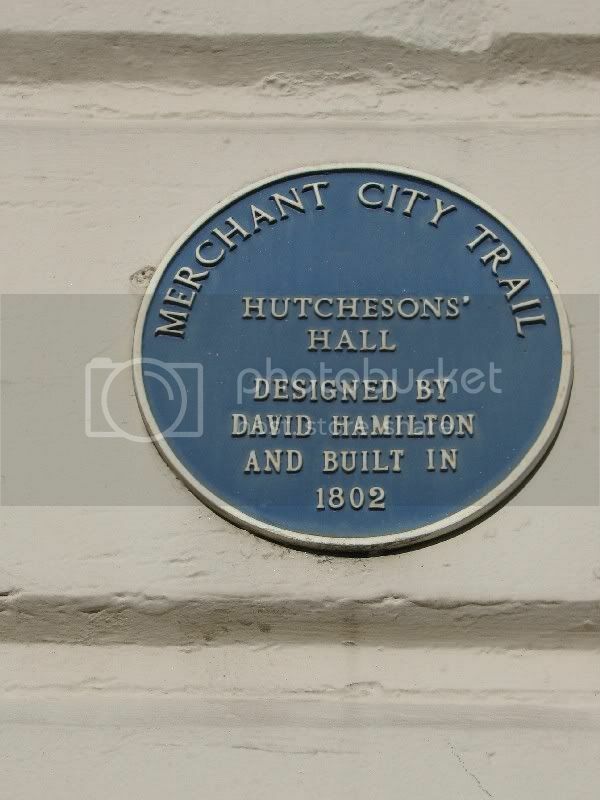 Opened 1790, occupies the site of the first Hutchesons' Hospital. 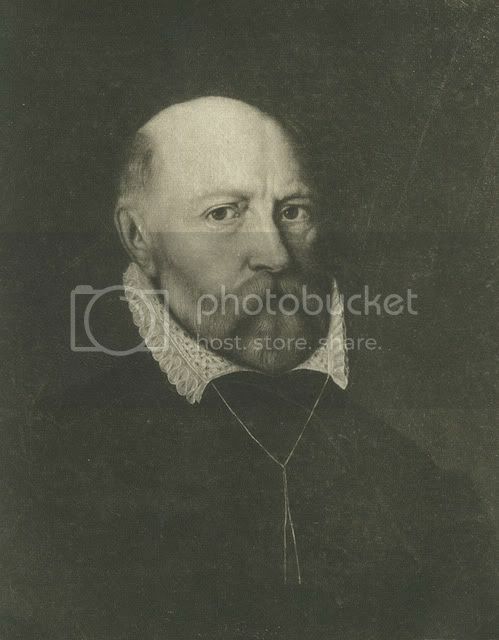 George Hutcheson, the founder, was born sometime between 1550 and 1560. He was joined in the work by his brother Thomas. Their father, Thomas Hutcheson of Lambhill, had died when Thomas was only five years old, leaving the older George to act as his guardian. Thomas received a good education and is said to have stated that this was one of "the blessings, and the pious and memorable exampell for which, under God, I am indebted to my brother George". George was a lawyer and money-lender. His office and house were on the north side of Trongate Street, near the site of the Tontine. In 1611 he built a house in Partick on the banks of the Kelvin. He died in 1639. Hutchesons' Hall, or Hospital, 158 Ingram Street, looking north along Hutcheson Street, c 1805. This new Hospital building was situated at the head of Hutcheson Street. Its front was 58 feet long and 55 feet wide. The distinctive octagonal spire is adorned with a clock and dial plate and stands 150 feet tall. The building is in the form of a cube with a steeple emerging from its centre. On the entrance facade, the principal storey is recessed behind two Corinthian columns, and there is a balustraded attic. Two niches hold seventeenth century statues of the philanthropic Hutcheson brothers, the city's leading benefactors at that time. The Great Hall of the new building housed Stirling's Library (until 1844) and, subsequently, the clearing room of the Glasgow banks. In 1876 the Hospital gained full use of the Hall after a major refurbishment of the entire building during which the original three storeys were reduced to two. In 1984 the National Trust for Scotland launched an appeal for funds to purchase the building which now accommodates its regional office. The richly decorated Victorian hall is open to public view, and the former boardroom is now the shop. 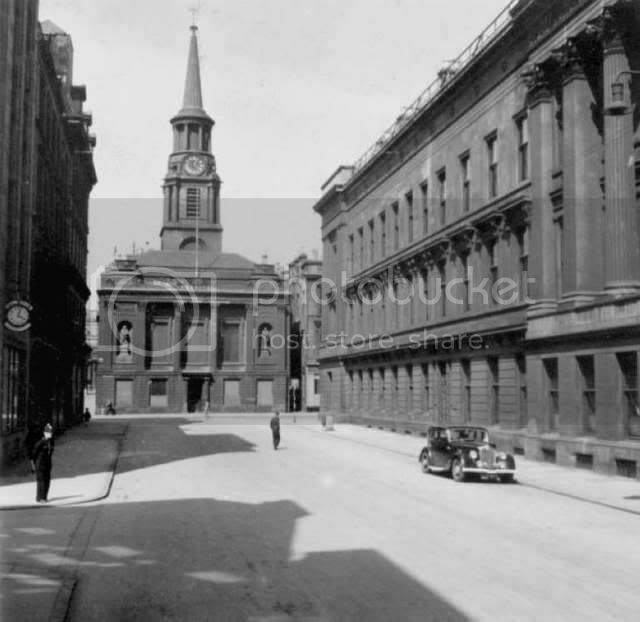 This view looks at the corner of Hutcheson's Hall or Hospital, with Ingram street running right to left in the foreground. Miller Street runs north to south along the west of the hospital. The painting is thought to have been by Anthony Van Dyck. Sculptor: James Colquhoun (fl. c. 1626-83). 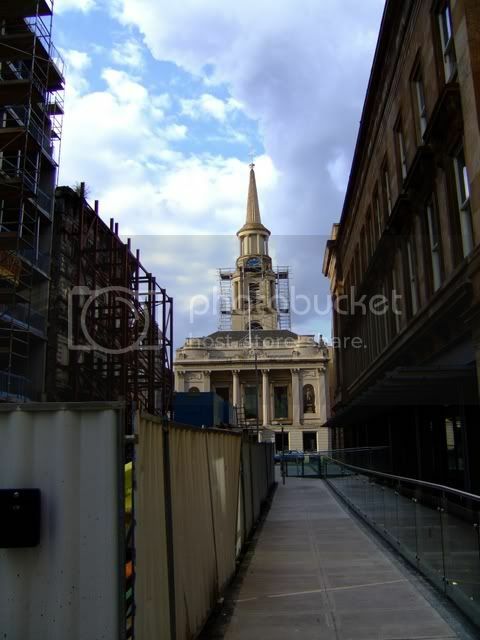 Location: Hutchesons' Hall, 158 Ingram Street, Glasgow. 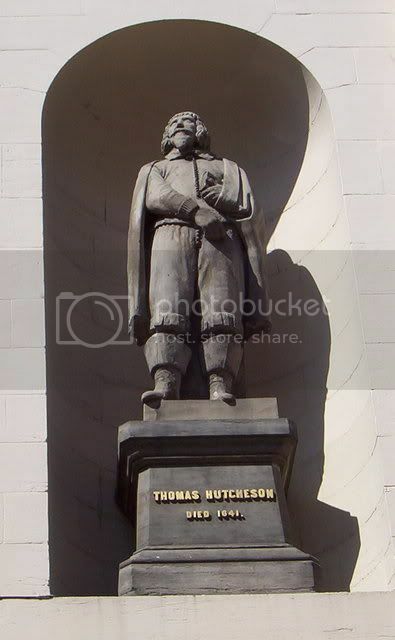 The oldest portrait statues in Glasgow, they commemorate the lawyers and landowners George Hutcheson (c. 1550-1639), the founder of Hutchesons’ Hospital, 1639, and his brother Thomas (c. 1589-1641), who founded Hutchesons’ Grammar School in 1641. The statues were carved in 1655 and 1659, and originally stood in niches on the north side of the tower of the first Hutchesons’ Hospital (built 1641-50), which stood in the Trongate until c. 1800. Carved in freestone from Loudon in Ayrshire, which had been purchased as early as 1643 for £99 Scots, they were originally brightly and colourfully painted, with flesh tones and vividly coloured costumes, and were separated by a large tablet with a Latin inscription (now lost) recording the brother’s philanthropy. Positioned at the back of the building, they were rarely seen by the general public. Placed in storage in the Merchants’ House in 1795 (their removal cost £2.3.6d Scots), when the building and land had been earmarked for development of Hutchesons’ Street, they were repaired and provided with new pedestals and inscriptions by architect William Reid in 1805-6, and placed on the façade of the new Hutchesons’ Hospital (now Hutchesons’ Hall) in 1824, in niches which had been designed for them by the building’s architect, in 1802-5. 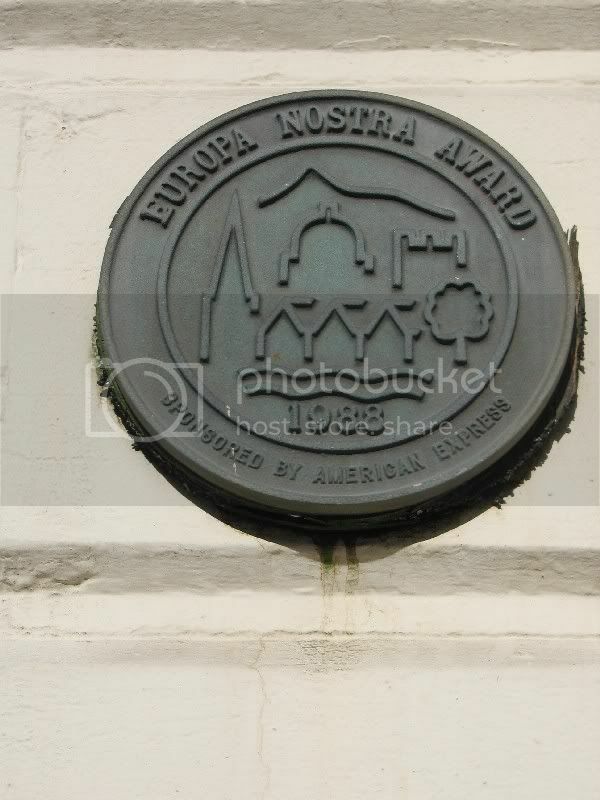 It seems, however, that the statues were placed on the wrong pedestals. 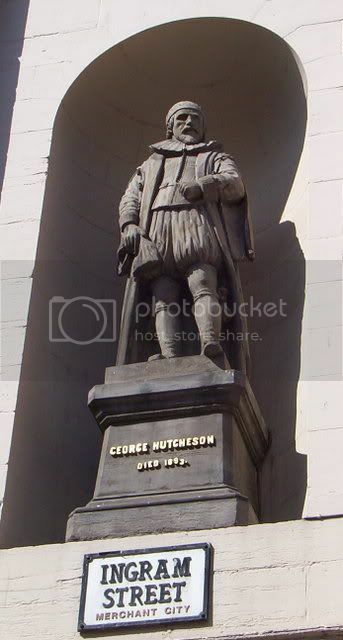 The inscription on George Hutcheson’s pedestal is also wrong, with the death date given as 1693, instead of 1639. Portraits of the brothers by Anthony Van Dyke, c. 1600s, (George Hutcheson) and George Scougall, 1717, (Thomas, published in Hill), together with stained glass and plaster portraits in the building's Function Hall, confirm the errors. 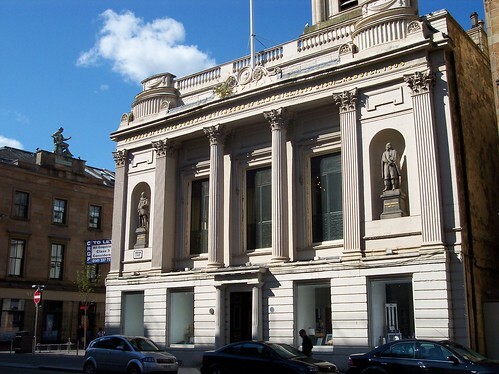 Interest in the statues’ history was rekindled in the early 1900s when the subject of the type of stone used for them was debated by the Old Glasgow Club. According to some, the original documentation recorded clearly that they had been carved from marble purchased in London, whilst others maintained that the mixture of old Scots and English in the text, together with the unclear handwriting of its author, had confused the issue in its use of the old Scots word for freestone: Marlar, from the Latin word for marble: Marmor, and the reading of Loudonne (sic) as London. To solve this vexing question, the club had the statues stripped of their layers of accumulated grime, guano and paint, and presented their findings in a paper read to the club in 1908, which confirmed that the statues had indeed been carved in freestone and that its place of origin was Loudon in Ayrshire (Old Glasgow Transactions, vol 2, 1908, p. 113). Archibald Macfarlane Shannan (1850-1915) circa 1912-13, copies of which are in the present Hutchesons’ Grammar School. 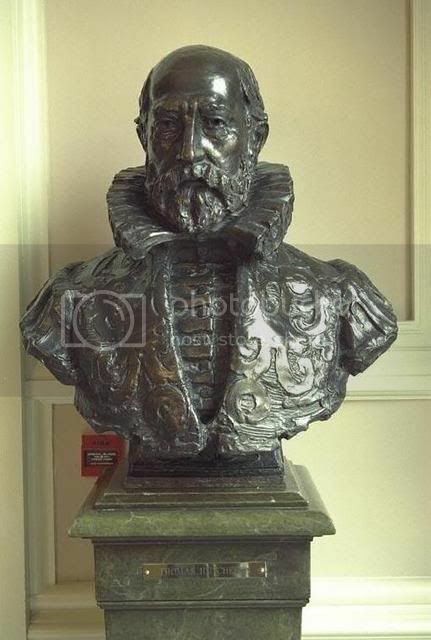 Bust of Thomas Hutchison of Lambhill. Died 1641. 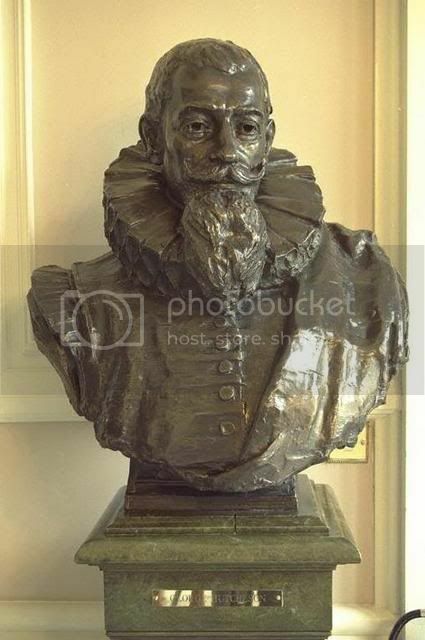 Bust of George Hutchison of Lambhill. Died 1639. Partick Castle was thought to have been built by Archbishop Spottiswood in 1611 as a country seat for the Archbishops. However, personal papers later revealed that it was actually built as a dwelling place for Thomas Hutcheson, by his brother. Partick was a small village, on the River Kelvin some two miles west of Glasgow Cross. The main industry was flour milling. In 1815 the Incorporation of Bakers of Glasgow processed 98,000 bolls of wheat in their mills at Partick. A huge cleared site to the west of Partick Central awaits residential development, as a corridor to connect the riverside to the West End. This was formerly the Partick Foundry and after closure in the 60s became the site of unsightly scrap metal depots. 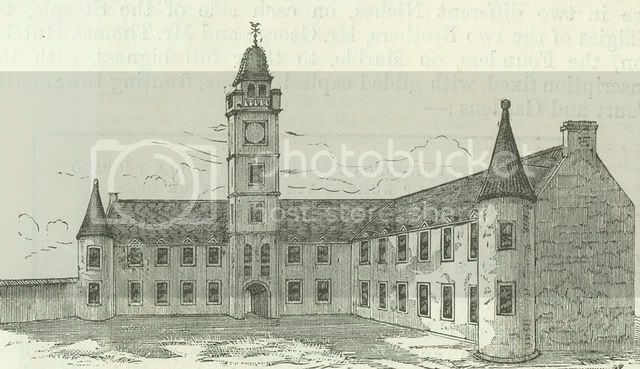 However, back around 1600 this was the site chosen for the building of Partick Castle, a fortified house serving as the country home of George Hutcheson, co-founder of Glasgow Hutcheson's Hospital. Partick Castle was demolished in 1836. 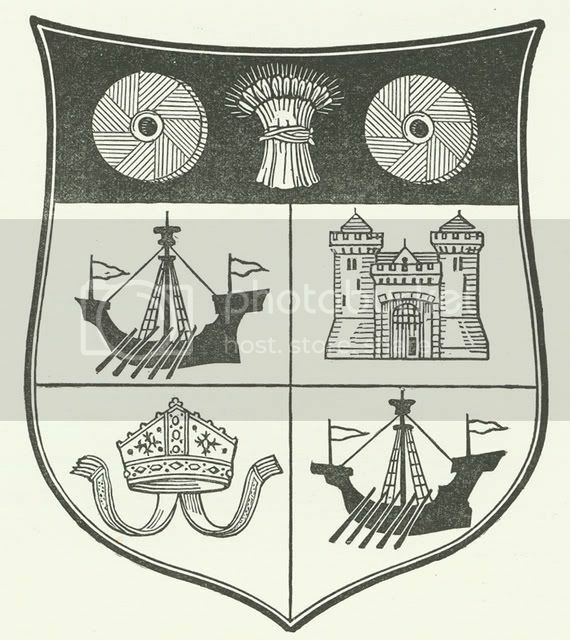 The coat of arms of the Burgh of Partick, approved by the Lord Lyon in 1872. Two of the quarters contain an image of a lymphad, or galley, probably a reference to the shipbuilding industry. The castle and bishop's mitre are thought to represent Partick Castle and the Bishops' mansion. At the top, the wheatsheaf and millstones hark back to the days of Partick's rural industries, and the mills on the banks of the River Kelvin. Partick Castle was built for George Hutcheson in 1611, on the west bank of the Kelvin. Its last traces disappeared in the 1830s. It is believed that the Bishops of Glasgow had a residence on the site before the Reformation. "Ye said George’s ain fute." In corroboration of this statement also, we find in Hamilton of Wishaw’s Description of Lanarkshire a passage to the following effect: "Above this, where Kelvin falls into Clyde, is the house of Pertique, a well-built and convenient house, well planted with barren timber and large gardens, which are enclosed with stone walls, and which formerly belonged to George Hutcheson in Glasgow, but now to John Crawford of Myltoun." It would therefore seem that The Castle, as it was generally called, was not of so ancient a date as was traditionally supposed. 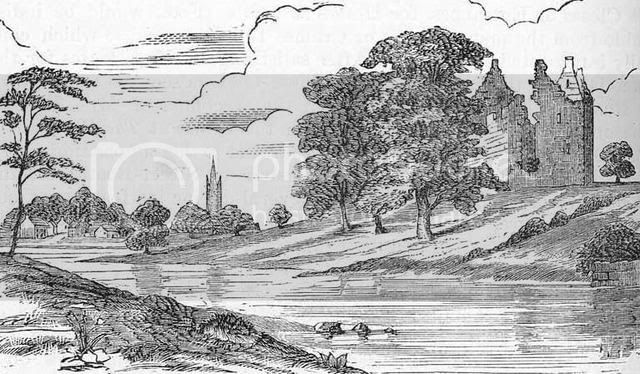 It is certain, however, that the proud prelates of Glasgow had for many years a favourite rural residence in the vicinity of Partick and nothing is more probable than that it was situated at this spot, which in those days must have been invested with a landscape beauty of no ordinary kind. Aye, top work bananaman. Can't wait to be retired and have the time to do this detail of research too. HH = the new Jack House. The highest compliment I can pay. red_kola wrote: Aye, top work bananaman. Can't wait to be retired and have the time to do this detail of research too. One night searching & a couple of hours putting it together, never left my chair. John R, you were right about the statue mix up! 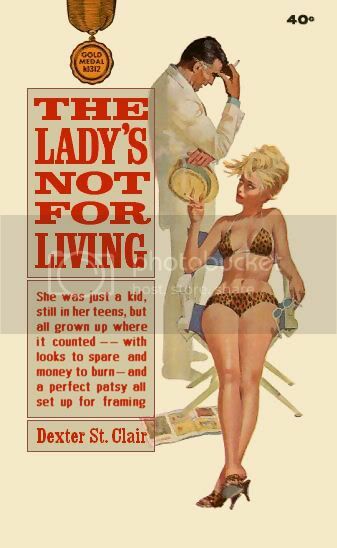 I always try to stick to the facts as I am scared of the wrath of Dex and being on the receiving end of "evidence please". Aye we're Hidden Glasgow not Wikipedia. Where children lave their feet"
Hi glad you dipped your toes in as your pictures are great well done.